The 59th Cannes Film Festival was held from 17 May to 28 May 2006. Twenty films from eleven countries were in competition for the Palme d'Or. The President of the Official selection Jury was Wong Kar-wai, the first Chinese director to preside over the jury. Official poster of the 59th Cannes Film Festival featuring a still from Wong Kar-wai's 2001 film In the Mood for Love. English director Ken Loach won the Palme d'Or with his movie The Wind That Shakes the Barley. Other winners were Pedro Almodóvar (Best Screenplay, Volver) and Alejandro González Iñárritu (Best Director, Babel). This also marked the first time in three years that no American film, actor, actress, or filmmaker won any awards in Cannes. The festival opened with the premiere screening of The Da Vinci Code, based on the novel by Dan Brown. Journalists gave the film a cool reception at its first press screening, with loud laughter breaking out at one of the pivotal scenes. Transylvania by Tony Gatlif closed the festival. Paris, je t'aime opened the Un Certain Regard section of the festival. 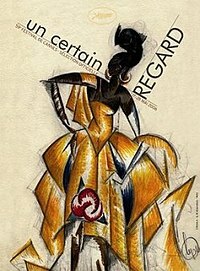 2006 Un Certain Regard poster featuring an original drawing by Russian filmmaker Sergei Eisenstein. The Cannes Classics section highlights heritage cinema, re-discovered films, restored prints and theatrical, television or DVD releases of great films of the past. Ken Loach, winner of the Palme d'Or at the event. ^ "Posters 2006". festival-cannes.fr. Archived from the original on 6 December 2013. ^ a b "Awards 2006: All Awards". festival-cannes.fr. Archived from the original on 9 November 2014. ^ a b c d e f "Official Selection 2006: All the Selection". festival-cannes.fr. Archived from the original on 3 December 2013. ^ "Wong picked as Cannes's first Chinese president". The Guardian. Guardian News and Media Limited. Retrieved 26 May 2017. ^ a b "59ème Festival de Cannes". cinema-francais.fr (in French). Retrieved 29 June 2017. ^ a b c d e "Cannes 2006 / Palmarés". cannes-fest.com (in French). Retrieved 29 June 2017. ^ "Fast Facts: 59th Cannes Film Festival Winners". Fox News. 29 May 2006. Retrieved 26 May 2017. ^ "2006 Cannes Film Festival Winners". strangecultureblog.com. Retrieved 26 May 2017. ^ "Da Vinci Code to open 2006 Cannes film festival". The Guardian. Guardian News and Media Limited. Retrieved 26 May 2017. ^ "Da Vinci Code panned at Cannes". London: dailymail.co.uk. 16 May 2006. Retrieved 26 May 2017. ^ "Cannes 2006 – Preview". urbancinefile.com.au. Retrieved 26 May 2017. ^ "Posters 2006". festival-cannes.fr. Archived from the original on 14 December 2013. ^ "All Juries 2006". festival-cannes.fr. Archived from the original on 4 March 2016. ^ "Cannes Classics — Tribute". festival-cannes.com. Retrieved 26 July 2017. ^ "45e Selecion de la Semaine de la Critique - 2006". archives.semainedelacritique.com. Retrieved 28 June 2017. ^ "Quinzaine 2006". quinzaine-realisateurs.com. Retrieved 28 June 2017. ^ "Awards 2006: Un Certain Regard". festival-cannes.com. Archived from the original on 14 March 2016. ^ "FIPRESCI Awards 2006". fipresci.org. Retrieved 29 June 2017. ^ "Jury Œcuménique Palmarés 2006". cannes.juryoecumenique.org. Retrieved 29 June 2017. ^ "Association Prix François Chalais Cannes 2006". francois-chalais.fr. Retrieved 25 June 2017. Wikimedia Commons has media related to 2006 Cannes Film Festival.